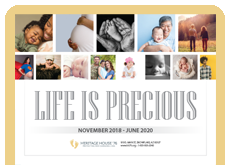 Convenient, lightweight gift with a POSITIVE message about the origin of precious human life to hand out alone or with a quick, yet powerful, read like “Why Prolife?” by Randy Alcorn. So refreshing to have this sweet image to promote the value of EVERY baby. UNBORN black lives matter!